Do you have a large family photo archive? So, it's program for you! 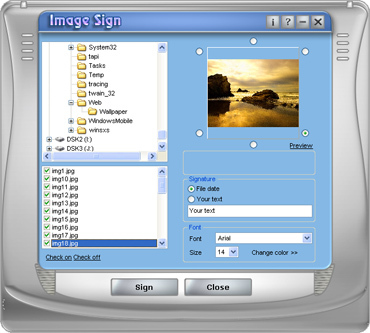 ImageSign help you to sign any photo by text or date. You may choose any font style, color and size. It's easy to use: select folder, enter text and click "Sign"!The inscription will help to save memory about the photo place or date. Use ImageSign and keep your photo archive in perfect condition! Sign 1 photo per click. This is a legal agreement which allows you, the end user, to use the Program under certain terms and conditions. If you cannot agree to abide by what this agreement says you should not use or evaluate the Program. The Program is fully protected by copyright under U.S. law and international treaty provisions.